Lisa Campbell, DNP, RN, PHNA-BC is a Professor of Nursing at Texas Tech University Health Sciences Center School of Nursing and has been an advocate and leader for over 30 years as a nurse practitioner and community health nurse. Dr. Campbell noted the magnitude of climate threats in her role as a director for a public health department. 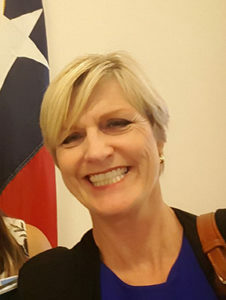 In her role, she worked to move forward climate solutions, such as maintaining essential vector-control programs, preparing communities for extreme heat days, developing plans for disaster preparedness, and advocating for policy change. She is currently the Chair of the American Public Health Association Public Health Nursing Section, which is a member of the Nursing Collaborative on Climate Change and Health. In this role she has been instrumental in increasing the sections engagement around climate and health. Dr. Campbell also participated in ANHE’s Climate, Health, and Nursing roundtable hosted by the White House. At this meeting, representatives from national nursing organizations met with senior staff and federal agencies to discuss the opportunities for nurses to address climate change and protect health. Read more about her experience at this roundtable event in a blog written for Campaign for Action.